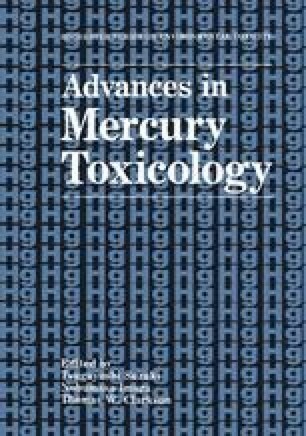 Alteration of many kinds of cellular functions by methylmercury (MM) exposure in vitro have been reported. However, the causal mechanism for the specific dysfunction of nervous systems has not been clarified yet. We have previously demonstrated that microtubules in cultured mouse glioma cells are specifically disrupted by MM before the morphological disorders of the other organelles are detected. This specific impairment of microtubules inhibited cell growth. In addition, we have recently found that the increased cellular pool of tubulin subunits by microtubule depolymerization with MM resulted in an inhibition of tubulin biosynthesis. Since the protein bands other than tubulin on gradient urea-PAGE gel appeared to remain unchanged under the experimental condition used, the inhibition of tubulin synthesis by MM was specific. This reduction in tubulin synthesis was well associated with the specific decline of mRNA level of β-tubulin. On the other hand, the transcription rate of tubulin gene was confirmed to be unchanged in isolated nuclei derived from MM-treated cells. These results indicate that the growth inhibitory concentration of MM depolymerizes microtubules in mouse glioma cells and, in addition, inhibits tubulin synthesis through the autoregulatory control by the increased pool of tubulin subunits probably at the post transcriptional stages as in the case of colchicine treatment.